Small luxury and adventure cruising has allowed Australians to explore some of the most isolated regions on earth. Relatively new to the world cruising scene, it was inevitable that this type of expedition style itinerary would really take off. At the higher end of the price scale, it is rather like having your own cruise boat to see wonders far from the normal tourist spots. This type of cruising has also proved a major boost for isolated people who can monitor the small numbers of visitors and maintain their culture. Many villages use the money generated by such visits to improve the education and public facilities in their region. The number and scope of small ship cruising is far too vast to cover in this section, but we wanted to give an overview of the Australia-Pacific region. Small ship cruising in Australia started on the Great Barrier Reef and then spread to the stunning Kimberley region. The shallow reefs, huge tides and narrow passages could only be traversed by small ships in expert hands. In the Pacific, Blue Lagoon started small ship cruising with an ex-WWII converted naval boat wandering through the Yasawas. These regions are still very popular, but you can now explore Vanuatu, New Caledonia, New Guinea and the Solomon Islands. Small ship cruises are also available in the lesser visited areas of south east Asia and Antarctica. Day to day life on board will include excursions on expedition craft which allow you to travel up rivers and land on beaches or rock ledges. Meals are mostly gourmet smorgasbords and most ships have a good wine list and small bar facilities. Expert commentators give talks on everything from marine life to local birds and cultures. You are never crowded on this type of cruise and you will make lots of friends as you share the adventure of a lifetime. Cruising the Barrier Reef and the Kimberley. The Kimberley cruise is one of the most spectacular journeys anywhere in the world. You can add on mini-holidays in Darwin and/or Broome. Their flagship, the stunning 73 passenger Oceanic Discoverer has outstanding expedition style cruising to New Guinea, the Solomon’s and Vanuatu. 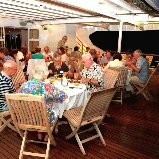 Offers a selection of cruises in Fiji aboard the spacious Reef Endeavour which carries up to 140 passengers. Great way to see the more isolated and stunningly beautiful islands of Fiji. Seven night cruises through the Kimberley aboard 36 passenger vessel. Cruises the Kimberley, Asia, Melanesia and Antarctica. Two ships carrying 120 plus passengers. Seven and 13 night itineraries aboard an 18 passenger ship with its own helipad. Pioneering Fiji operator has three cruise ships in its fleet offering a variety of packages. The lagoons of the Yasawas are unforgettable.